It's been a big day at the bottom of the table, with Aston Villa's 28-year top-flight stay coming to an end this afternoon. BBC Sport's chief football writer Phil McNulty writes about Villa's 'Usain Bolt-style dash towards the drop' which you can read more of by clicking here. Thanks, as always, for joining us. There'll be more of the same on Sunday as we focus on the top of the table with top of the table Leicester City in action against West Ham. We're coming to the end of this live text, but there is Match of the Day to look forward to this evening. It's the battle to avoid relegation which takes precedent, with the programme kicking off with Norwich's humdinger with Sunderland, followed by Newcastle's must-win match against Swansea. It was a comprehensive win and you can read the match report by clicking here. The win moves Manchester City closer to securing Champions League football next season and, who knows, they might win the Europe's top prize this season. Chelsea have nothing to play for and, for the majority of the match, it showed. Sergio Aguero will dominate the headlines for his hat-trick, but Kevin De Bruyne was jaw-droppingly good. The midfielder was key to City's rapid counter-attacking and the graphic below illustrates the touches the Belgium international had during the match, showing he had plenty of the ball inside Chelsea's half. Whatever the problems were with Jose, the worst thing we did was sack him!! These players need to take responsibility for a dismal season. Will conte sort us out next season? i hope so but we'll see...much to do. "Chelsea are a difficult situation this season. We managed to get out of the relegation zone but Chelsea need to be in the first four places. We were knocking on the door but we didn’t create open chances. They outplayed us on 60-70 yard counters. "The fans have had a very disappointing season. We’ve got out of near the relegation zone in a relatively short period of time. I told the boys you cannot let it slip away. Man City you have to recognise they are having a very good season. "Man City are a rather strong opponent and have a lot experience playing in semis and finals. To win silverware you have to be in very good shape in April." Viv: I wholly, undoubtedly & absolutely agree with Pellegrini, Aguero is the best striker in the league.Stats don't lie! Asked about Yaya Toure, Pellegrini says: "When he doesn't play and we win everyone says he should not play. We have a lot of games. We play and lose without him. He continues to be an important player for the team and he's made a different since coming back from injury. I'm happy with his performance. Unfortunately, he is an old player but he knows what criticism is important and not important." “I am satisfied with the team, they played well in attacking and defending. When all the players are fit and playing together, it is another team. "I knew before game that Chelsea can be difficult but I wanted revenge for the FA Cup defeat when we played here with a young team and they beat us. "Tonight was a complete game. It is important points for the Premier League, we want to finish as near the top as we can." Asked whether Chelsea can return to the higher echelons of the Premier League next season, Guus Hiddink says: "Reasonable work, but they must not panic. They must analyse the situation and take measurement." 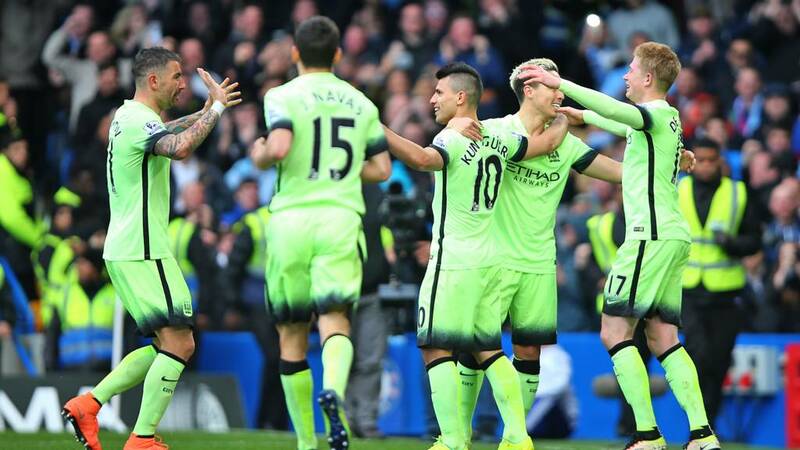 Mwansa Lombe Kaluba: #ManCity used the game with #Chelsea as a preparatory match for that #ChampionsLeague game with #RealMadrid. Liz Tray: Shocked at how little passion/fight Chelsea showed. We didn't even have to play that well to stroll it. Let's get 3rd now! Was motivation an issue? "We always want to win, but they have a class team and they are eager to go into at least fourth position in the Champions League," says Guus Hiddink. "They are smart and we have to recognise that." "It was a difficult game against a well-organised and skillful team," says Guus Hiddink. "It's not for nothing that they are at the top of Europe now. We sometimes had dominance in the game, but they were sharp and skilful on the counter-attack. We got caught. We were naive how we defended." Colin Ward: Aguero level with Vardy & only 1 goal behind Kane despite playing 900 mins less, no doubt about the best striker in PL then! "I'm sure he's the best striker in this league," says Manuel Pellegrini when asked whether Sergio Aguero is the best poacher in the land. Dear Mr Hiddink, if you're still licking your wounds I'm sorry but I have some more salt to throw on them. This was Chelsea’s heaviest home defeat in the Premier League since losing 3-0 to Sunderland in November 2010. Not sure I subscribe to the theory Chelsea are shoe ins for an automatic return to the top 4 next year. This team looks completely broken. Blaming Hiddink is pretty bizarre. As for Mourinho doing a better job - he was destroying team and club. So, there we have it, two league defeats on the trot for the defending champions who remain 10th in the league. The first against Swansea and now a sound beating by Manchester City. What does it all mean? That Guus Hiddink has lost two league games in a row as a club manager for the first time since February 2004, when he was at PSV Eindhoven. Yousuf Ali: Let the U21s&U18 play the rest of the season for Chelsea. The first team players never returned from vacation. Yaya Toure speaking on Sky Sports: "I think one of our best games of the season because we controlled the game and to play at Stamford Bridge is not easy and we played really well. "I was delighted to help team-mates because I missed two games and it is always difficult to watch and I am really satisfied for the team today. "I always want to work hard for this team. We have important games coming and I will do my best where I can."